Timmins, July 11 - (CP) - Not to be outdone by the flights of fancy of flying saucer observers all over the world, a Timmins resident reported today he and his wife witnessed a strange cosmic phenomenon last night. Was it a bird? Was it a plane? Was it Supermouse, or his more famous partner in crime suppression, Superman? Perhaps a more plausible explanation of the long, white jagged streak that hurtled through the southwest sky about 5:05 p.m. yesterday is that it was a meteorite, or maybe the tail of a strange new comet recently reported by astronomers. Anyhow, it had North Bay people plenty excited. Telephones in The Nugget's editorial department, jangled for half an hour after the incident as observant North Bayites called to report the "comet" or ask that a photographer rush right outside and click his shutter. The best description came from Mrs. F. R. Paterson, who telephoned while the "thing" was still in action. Mrs. Paterson lives 497 Worthington street east and she had a clear view of the fireworks, as they travelled in a southeasterly direction over Lake Nipissing. "It was like a long, white, jagged streak, and first it came down just like a sky rocket," she said. "Then it burst and fanned out in a zig-zag pattern of long feathery marks." She said that these "feathery marks" were visible for three or four moments after the burst. A clear view of the meteorite was also reported by Sam Dominico, who saw it over the CPR shops. An indescribable "thing" of a yellow orange color, oblong in shape, flew in circles over North Bay early this morning, Sam Veraldi, 380 Main street east, told The Nugget today. Mr. Veraldi said the "thing" - which flew in a circle and so low that it seemed to be just clearing the rooftops of houses in the vicinity - was first observed by his wife, who summoned him to the window. He and his wife watched the "thing" fly past in a swift circle for a long time, Mr. Veraldi said. They first observed it at 5 o'clock this morning. From where he stood at the window, the "thing" seemed to be flat and oblong, about two feet in length and zooming about overhead "like a merry-go-round." He said it swung in circles from the northeast and went by repeatedly, making no sound. There seemed to be "holes" in the front portion of the "thing," said Mr. Veraldi. FORT WILLIAM, March 30 - (CP) - Airport employees said Wednesday they watched five "unusual" objects streaking through the sky like "brilliant white balls of fire" at about 1:45 p.m.
"But a bird couldn't possibly fly that fast," said flying-club manager Norman Evans. "There were no wings visible, and they were white - brilliant white. A bird will seem dark against the sky." Sudbury Man Sees "Flying Saucer"
Sudbury, April 17 - Those saucers are back again! Arthur Penny was strolling down Landsdowne street here about 3 o'clock Saturday afternoon when he saw what he described as a "flying saucer" heading west at a rapid rate. "It looked like two pie-plates one on top of the other," Penny said, in describing the sight. 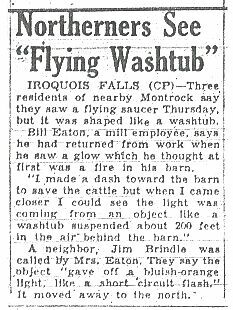 "It was smooth and about the size of a small washtub." The whirling object was only at medium height, according to Penny, who stated he had seen airplanes flying much higher. It had a smooth surface, he said. Saturday's incident was the first unusual phenomenon in the sky to come to light in the Sudbury district since March 21, when a woman at Whitefish Falls, 60 miles west of here, reported seeing a "round, silvery object" in the sky. 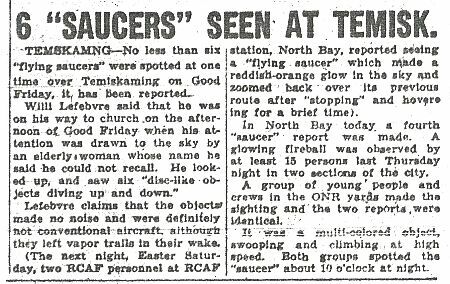 Timmins, April 18 - (CP) - Newspaper telephones buzzed Monday night as residents reported the third "raid" of flying saucers on the northern Ontario community since April 1. One of the witnesses said that the "saucer" first appeared on the sky alone, then darted away to return with another similar object. Both appeared as blobs of light against the clouds. The "raid" lasted about 15 minutes. Two distinct sightings of "flying saucers" over the vicinity of North Bay have been reported to RCAF authorities by air force personnel at the North Bay station. Air force officials told The Daily Nugget today that they have no reason to doubt the validity of the reports, since the men concerned are all veteran personnel familiar with conventional aircraft. The reports will be turned over to the RCAF intelligence. "We are not even going to try to account for them (the two incidents)," an officer said. He said there were no aircraft known to be in the air at the time the flying saucers were seen. One was seen last Saturday night; the other the night of January 1. 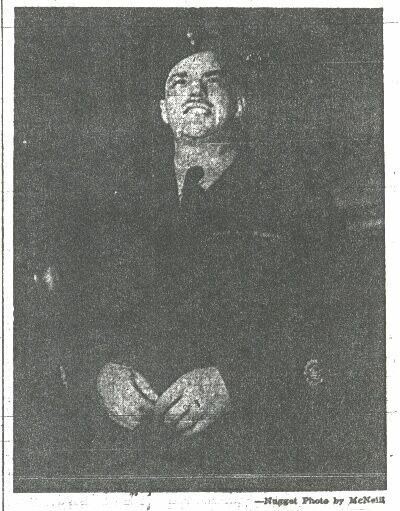 The incident of Saturday night was reported by Warrant Officer First Class E. H. Rossell, an aircraft maintenance superintendent of 13 years RCAF service, and a visiting flight sergeant from Weston. WOI Rossell and Flt. Sgt. Reg. 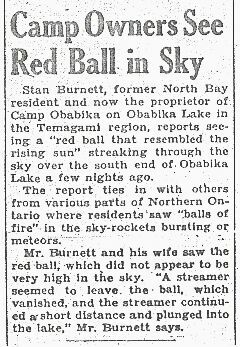 McRae said that they were driving towards North Bay from Rossell's home in the married quarters of the station when they spotted a "bright amber disk" in the sky over the air field. Time was about 8:30 p.m. They said that the disk came from the southwest, moved across the air field, STOPPED AND THEN TOOK OFF IN THE REVERSE DIRECTION (THAT IS, THE DIRECTION FROM WHICH IT HAD COME). The object climbed at an angle of 30 degrees, at "terrific speed" and disappeared from sight. 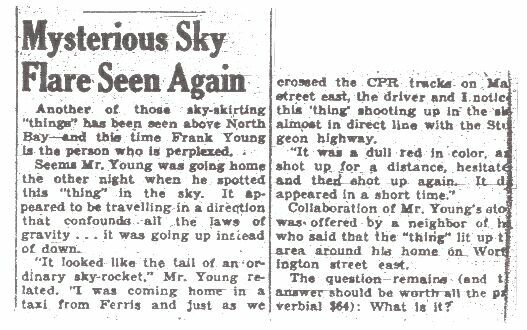 "At 22:54 hours, (10:54 p.m.) 1st Jan. 1952, while making ice at the rink in the married quarters area (at the North Bay station), a flying saucer was sighted by WO Yeo and Sgt. Crandell. Direction: Appeared in the northwest and proceeded to the southeast where it disappeared. The direction altered slightly at times, zigzagging and climbing and diving." "The saucer appeared to be at great height probably outside the earth's hemisphere. The saucer appeared to be moving at supersonic (greater than the speed of sound) speed. Elapsed time between the sighting of the disk and its disappearance was eight minutes and 43 seconds. At times, it seemed to slow down and dart away again." "In color it was a reddish-orange, similar to a rocket burning, as compared to the blue-white of the stars. During this time, and for several minutes after (it disappeared) all flooding activity ceased to check for sound. There was no sound." "The weather was clear and cold - 10 degrees above zero, Fahrenheit - and there was a cloud bank to the south where sight of the object was lost." Those are the reports. For the first time in several years, they bring to the fore as far as North Bay is concerned, the "flying saucer mystery." Interest in the saucers reached a new high with the release a few days ago of an article in Life magazine, listing 10 authenticated accounts of strange objects seen in the sky, most of them over the southern United States. Life's conclusion is that the saucers are not figments of the imagination, and that they are definitely NOT MAN-MADE OBJECTS. SPOTS "SAUCER" - Warrant Officer First Class W. J. Yeo (above), a master telecommunications superintendent at RCAF Station North Bay, is one of four air force personnel who recently reported seeing "flying saucers" over the big station. WO Yeo and Sgt. 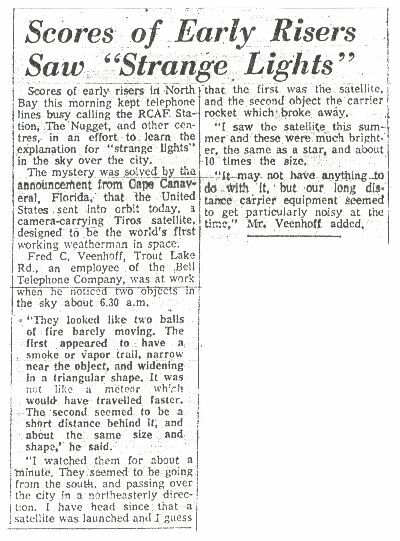 D. V. Crandell said they saw a reddish-orange disc moving across the sky at terrific speed. "At times it seemed to slow down and dart away again," WO Yeo said. The disc was kept in view for a timed eight minutes and 43 seconds when it disappeared. "It looked like a blow torch in the sky," WO Yeo added. "And it definitely wasn't a meteor, a balloon or an ordinary aircraft." The reports have been sent to RCAF Intelligence. An object resembling the recently publicized flying saucers was reported today to have been seen over Sunset Park by a resident. A noiseless round object travelling "quite high and fast" was reported by Miss Bernice Byers to have passed over the district at 11 a.m. today. Miss Byers said that at first she thought the white object was a jet plane, but the absence of noise prompted her to look more closely. The object passed over the district from west to east leaving a vapor trail, she said. 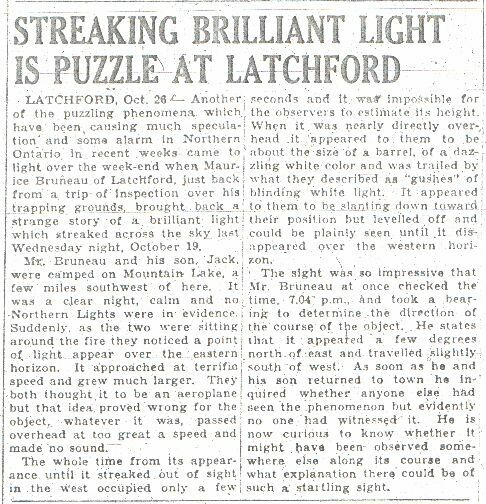 NEW LISKEARD - Many and varied are the conjectures as to just what the object was that was seen in the sky here on Monday around noon, by several persons. Mrs. Sandy McLean was walking north on Armstrong close to the bridge when she noticed a trail of vapor streaking southward across the sky. At the tip of the streak was a tiny glittering object, about the size of an electric tea-kettle, but the bright sun prevented any decision regarding its shape. Mrs. McLean called Chris Douglas from his store at the bridgehead and he also saw the vapor trail as it disappeared in the direction of North Bay. Another witness of the event was Mrs. J. W. McKinley who heard the first two talking about the vapor and came out of her apartment to see what was going on. She says she saw quite distinctly a large silver disc with a long snake-like trail of smoky vapor behind it. There are "flying saucer" in the skies over North Bay. They have been seen with amazing regularly. It is virtually certain the objects are ships of a revolutionary design flown here from outer space, possibly another planet of the solar system. Those three statements, indicated by a frightening bulk of evidence, defy denial, this newspaper believes. 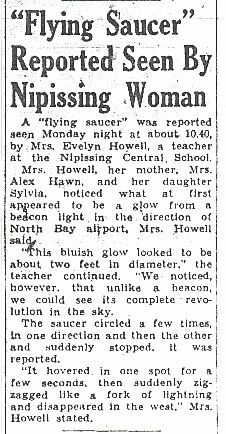 Since the winter of 1951-52, there have been 16 sightings of strange objects flying over this immediate district reported to The Daily Nugget. Now a newly-published book, "Flying Saucers From Outer Space," has confirmed the fact that saucer sightings in North Bay are upheld as genuine by the RCAF intelligence, the Canadian defence department and the U.S. Air Force flying saucer investigation branch. 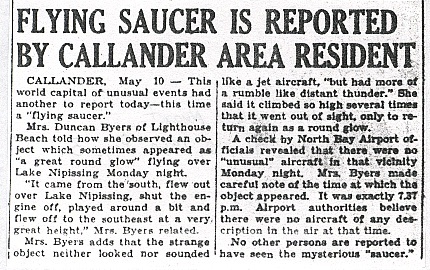 About half of the flying saucer sightings reported to this newspaper have been published in news stories. The others were withheld because the persons making the reports did so in confidence and asked that no publicity ensue. 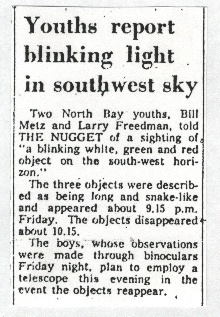 One reliable North Bay citizen only three weeks ago gave a Nugget editor details of a dozen night sightings of a "funny orange globe" which came out of the northeastern skies, wandered back and forth along the horizon and then vanished with incredible speed. More recently, two Sturgeon Falls residents chased a low-flying glowing disc along Highway 17, a few miles west of the city. All the sightings have been backed by convincing detail. 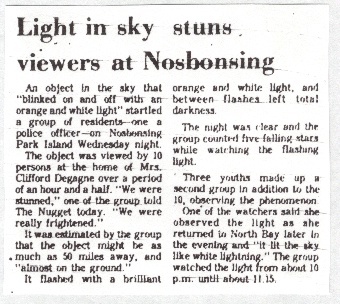 In the fall of 1951, three people reported a day-time sighting over Lake Nipissing. Each saw it from a different shore and did not know of the other reports. Yet their report on the time of the sighting, the appearance of the "silver, round-shaped star" and the strange manoeuvres it made checked and double-checked. It couldn't be hallucination. But the most authoritative accounts on the record are still those made on New Year's Day of 1952 by personnel at RCAF Station North Bay. It is these that are most widely quoted in the recent book published by U.S. Major Donald E. Keyhoe and supported by U.S. and Canadian air force authorities. 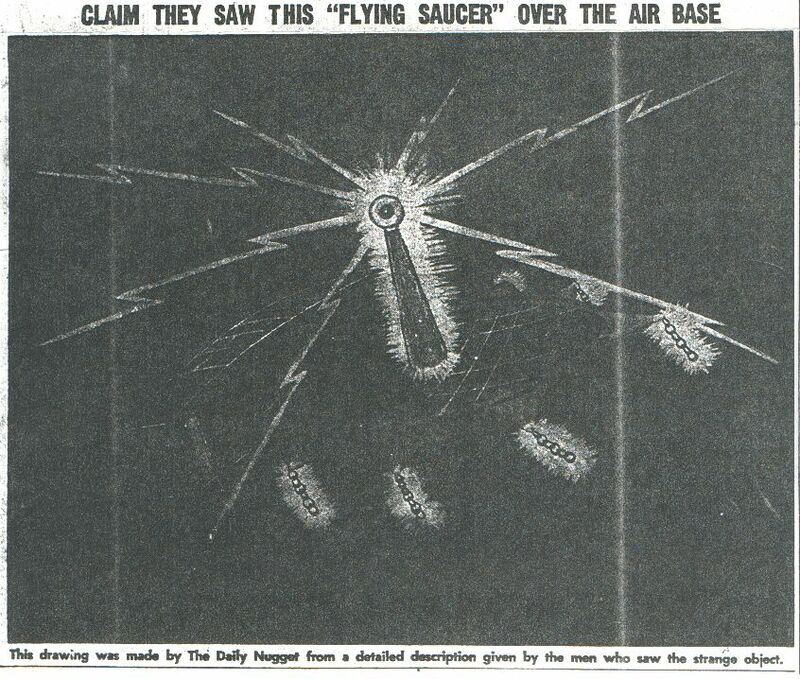 Major Keyhoe writes it was the saucer sightings by airmen at North Bay which first convinced the Canadian government that flying saucers were not a hoax. 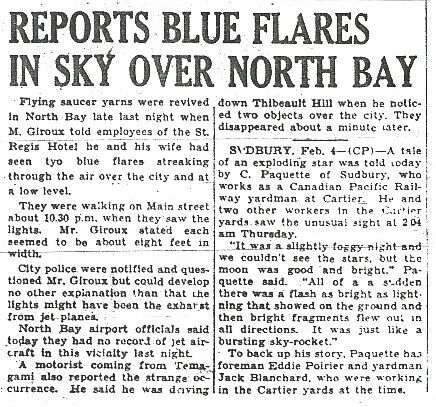 "On the night of Jan. 1, 1952, an orange-red disc appeared over North Bay where the RCAF has a new jet base. For eight minutes, flying at a high altitude, the machine circled, dived and zig-zagged over the field. From its estimated height in the stratosphere, the saucer was one of the largest ever sighted. Its movements were made at supersonic speed." "When the report was first published, RCAF intelligence refused to comment. 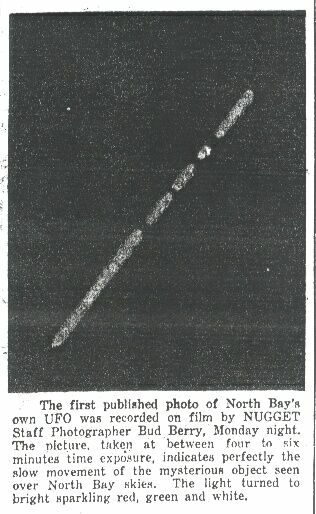 Then a second saucer was reported, again over North Bay. Approaching from the southwest, it stopped directly over the air base. After hovering for a moment, it swiftly reversed direction. Climbing at an angle of 30 degrees, it disappeared at tremendous speed." 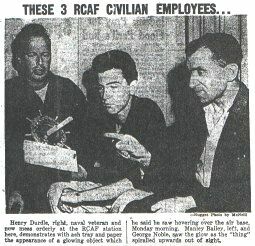 Qualified airmen with experience in judging height, speed and sizes of flying objects made the sightings and filed complete intelligence reports to Ottawa. As a result, a high-level conference was held in Ottawa and the RCAF, with the National Defence Research Board, began a serious investigation. The project went on the "top secret" list. Since that time, The Daily Nugget has reason to believe other incidents have occurred here which have attracted attention of the air force. RCAF officials at the North Bay base will make no comment. The downtown RCAF filter centre which receives reports from a wide network of civilian observers is also silent on the saucer question. Major Keyhoe's book cites hundreds of sightings in the U.S. but the main Canadian reports have been those from North Bay. This district seems to be the centre of saucer activities in Canada. Why? That's a mystery at which almost anyone can guess. 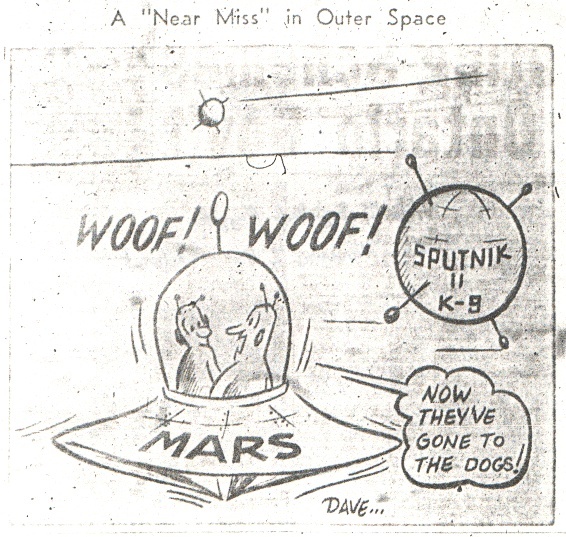 Keyhoe sums up his findings with a statement that flying saucers are almost certainly not of this world. All evidence points to the fact that they are guided, controlled and occupied by being of high intelligence. They perform at speeds as yet unattempted by science and their silent method of propulsion is something unknown to man. The writer winds up his summary on a frightening note. He firmly believes that earth is under study by beings from another world and the climax will come when the invaders from Mars, Venus or whatever their home planet finally land on this earth. A "Great Glowing Ball of Light"
New "Flying Saucer" Seen at Air Base? EDITOR'S NOTE: Did a flying saucer visit RCAF Station North Bay Monday morning? Nugget reporter Joan Hollobon today talked with three men who said they saw a mysterious glowing object hovering over the new RCAF fighter base just before dawn Monday. One of them, Henry Durdle, who says he saw the object first and for the longest time, gave the newspaper a detailed account of the incident. A war veteran, he is familiar with conventional flying devices and claims the strange machine resembled none of them. Here is the story as Reporter Hollobon received it from the men. The details are graphic and, if true, strangely disturbing. Miss Hollobon, who first treated the incident with some skepticism, says: "It doesn't seem possible to me that these men could have invented this. I think they saw something." This is not the first time that mysterious unknown objects have been reported over the four-year old air base. Three years ago, two airmen filed a report on a "flying saucer" over the runway and prompted a detailed investigation by highranking RCAF officials. Results of that investigation were never revealed. According to our information, the Monday incident is the fourth "flying saucer" reported at the RCAF station. There may have been others. Since the original incidents, RCAF personnel have not been permitted to talk about "saucers." A Naval veteran with seven-years service at sea, now employed as a civilian by the North Bay RCAF station, accustomed to the sight of planes and weapons, declared today that he had seen something "like nothing I ever saw before" over the air base Monday morning. The great, glowing, noiseless object hovered a few feet above a nearby telegraph post shooting out "tremendous sparks, like knitting needles of lightning" while he cowered in a doorway thinking his last moment had come. He watched it in frozen awe for "about ten minutes," he said, then as it did not seem intent on doing any harm, he dashed back into the building and fetched others to see it. As they arrived, it rose slowly with a "great glowing ball of light" and spiralled away until it stopped possibly a mile or more from them. There again, it hovered "glowing like a great pulsating heart of light," said a second man. Henry Durdle, a man of about 40, was born in Nova Scotia of Canadian parents, who died when he was a small child. He was taken to Scotland and brought up by relatives. For many years, he lived at Inverness. He still has one aunt in North Sydney, N.S. He served with the Royal Navy for four years and was rescued when HMS Hood was sunk by the German battleship Bismarck, May 24, 1941. Wounded and hospitalized for 15 months, Mr. Durdle was invalided out of the navy, but that did not put a stop to his war service. He joined the Merchant Navy and served with minesweepers out of Aberdeen. Henry Durdle has been in Canada for about eight months and is employed as a mess orderly at the RCAF station. He lives in barracks on the station. He was standing at the doorway of a station building about 5:40 Monday morning as the sky was just beginning to get light. Suddenly he saw something bright coming towards him from the northeast at a terrific rate. His first terrified reaction was that it was a plane crashing. At the same moment, he realized there was no noise. The thought flashed across his mind: "He's crashing, but he's cut his engine." He tried to start backwards into the shelter of the doorway, but it happened so fast that he still had his eyes on the "crashing plane" when he realized it had stopped. Amazed, he stopped, and again his first thought was a logical explanation. "An airship," he thought, visualizing the pre-war ill-fated British "blimp" the R-101, or something similar. By this time, the "thing" was so close that he could make out the outlines and he saw that it was nothing like any "blimp" he had ever seen or heard of. For one thing, there was a brilliant light or glow in the centre. For another, it was an odd shape. The top part was a circle, with a sort of rectangular box hanging down at the bottom. The light come from a sort of cone sticking out in the centre of the circle, with a globe at the tip which revolved very fast and emitted the long sparks of light. As the globe on the cone revolved, it cast light back onto the circle and on the top of the box. The top of the box and the top half of the circle were covered with a sort of lattice work. In other words, in shape it looked something like a round plate hanging on a wall with a rectangular box attached an inch or so up on the bottom and extending each side of the plate. The cone was in the centre of the plate. A smaller cone emitting was in the top latticed half of the plate. As he watched, the whole thing slowed from the vertical to the horizontal, as though the plate on the wall suddenly swung up edgeways on. Now he had a different view. He could no longer see the inside of the circle, which as it swung over, he noticed appeared to be concave but "with sharp edges." He could no longer see the "latticed" appearance of the top of the circle or the box. Instead of the cone of light pointing towards him, it was now vertical, and the cone appeared to revolve on its base as well as the globe or cupola at the top. It gave out an intense glow of light. He could now see the box part side on and saw a vertical slit of light "like an open door" in the side of the box towards the attached circle. Just inside this "door" at its right hand side, he saw two or three things that looked "like levers with knobs." As the thing swung from the vertical to the horizontal rays of light shot out of the perimeter of the circle and there were also "things hanging down, like sort of links of light." These had not been visible when the thing was vertical, but as it swung over to the horizontal, the "chains" - whether actual tangible chains brilliantly reflecting light or whether constant interlocked links of light itself, he could not tell - could be seen hanging down shimmering. About six, he thought. Measurements were a problem, because he could not tell too accurately the exact distance of the thing from him, and his estimate might therefore be quite a bit out. However, Mr. Durdle said he thought the thing was hovering about six feet above a telegraph pole. He estimated the "box" at about 15 feet from side to side and about six feet deep. The circle, he said he thought would be about six feet across - a circumference of roughly 18 feet - and the cone stood about six or seven feet up from the centre of the circle. The "knitting needles of light" which shot out so terrifyingly from the thing he estimated at about 17 or 18 feet long. A quietly spoken man, Mr. Durdle had great difficulty in describing what he had seen. Not having too fluent a command of language, his meaning did not become completely clear until Nugget photographer John McNeill drew a series of sketches. Immediately, the ex-seaman corrected them. "No, no," he would say, "not quite like that, but more rounded here," or "That part's bigger there," or "I couldn't see that except when the light shone on it." At first, he said, he was terrified. "I thought it was coming for me. I thought it was going to cross me off for sure," he said in his slow way. After watching it for a while, he dashed into the building to fetch others to see it. "Come and see this, it's like nothing I ever seen, maybe it's a flying saucer," he told them, earnest and round-eyed. They laughed at him. Only four men bothered to go and look. Tony McLeod saw the glow through a window. Leo Blais saw the thing from the doorway, but it was moving away. George Noble, son of an RCAF flight sergeant, who works at the station during his school holidays, saw it from outside, but it was already spiralling upwards. Manley Bailey, a civilian employee, also saw it then. Both men stood and watched it as it moved away. When it got maybe a mile or so away, it stopped and hovered there over the bush. The light expanded and contracted as it stood there. First, the glow, then about every two seconds, the glow expanded greatly with two "pulsations" - sssh - sssh - then down again, as Bailey described it bringing his arched hands in and out towards each other. Durdle said that when the thing prepared to spiral upwards, the glowing cone greatly increased in brilliance "like the moon when it's rising." As it moved upwards, it glowed so brilliantly that he could no longer discern the shape of the circle - it all appeared to be one huge, brilliant radiance. Bailey and Noble had the same impression of it. Bailey said he watched it hovering on the horizon for possibly 15 minutes, then had to leave and go to his work. 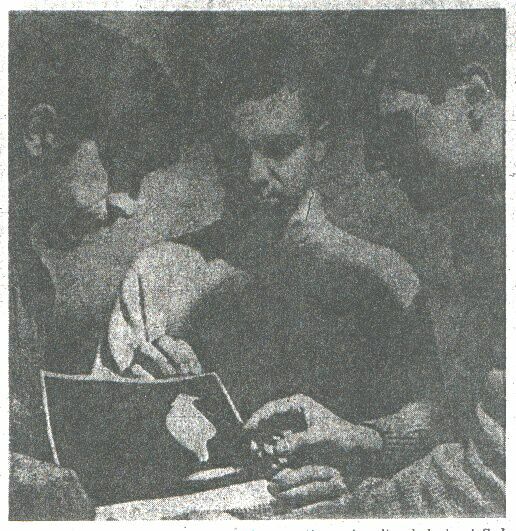 Noble described it as "a great glowing ball, like a pulsating heart." Bailey said that one day, they were talking about flying saucers and Durdle had never heard of them. They told him all the flying saucer theories and tales and Durdle laughed. He waved a hand skeptically, "Oh that's all a yarn, them things don't exist," he said and laughed. A red glow in the sky was seen again early this morning by a resident of Victoria street, North Bay. Wakened about 2:30 a.m. by her cat mewing on the window sill, she got up and went to the back door to let the animal in. As she stood on the doorstep, she said that in the southwest, she saw a deep red glow "which quivered all the time." It did not move about the sky, but stood in the one spot above the horizon. Thinking it was a fire or an engine in the CPR yards, she watched it, she said, for about five minutes. Then she got back into bed and sat watching it through the window for a few minutes longer, before going to sleep. TIMMINS (Special) - "Come quick, do you want to see something funny, it might be a flying saucer," yelled a man all in one breath at his startled friends Monday evening. George Sheridan, deputy chief forest ranger of the Timmins district was visiting friends at Wawaitin Falls, 14 miles south of Timmins. Don Ouimet, an employee at the Hydro generating station at Wawaitin Falls, said that the three couples trooped outside and saw a glowing ball in the sky to the west. Someone dashed in and grabbed a pair of binoculars and they stood outside for four or five minutes, passing them from hand to hand, looking at the phenomenon. Mr. Sheridan had been watching it for two or three minutes before he called the others. Mr. Ouimet said the thing was reddish-orange and very brilliant. It was about eight or ten miles away and low over the tree tops. The light appeared to be fairly steady but the object kept swooping up and down over the trees. "It kept dipping up and down, it seemed to be looking around the trees, kinda looking the country over. It was going very slowly, that's what amazed me - always you hear reports of anything like this and they are supposed to be travelling very fast, this was so slow." Mr. Ouimet was hesitant about venturing any opinion on its shape. "It was so far away," he said, "that even through binoculars, it was hard to see clearly. It seemed to be round or perhaps oblong, but I really wouldn't like to say. It would be impossible to tell accurately. All I know is, I have never seen anything like it before in my life and never expect to again." 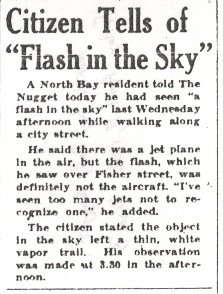 At dawn, Monday, a civilian employee of the North Bay RCAF station claimed to have seen a strange object hovering over the base and described it to the Nugget in detail. He also described the thing as "dipping" or "swooping" up and down and when it went away, it rose in a spiral. Mr. Ouimet said that the object west of Wawaitin Falls did not rise in the sky but slowly disappeared into the southwest. There is no town at Wawaitin Falls, only a hydro generating station, a lands and forest base and a colony of the homes of employees. There is also an observer post of the Ground Observer Corps there, said Mr. Ouimet, and "we have models and descriptions of planes here." It was quite definitely nothing like any kind of plane he had ever seen, he said. COBALT - Last night, a flying saucer visited the Cobalt district. No other explanation seems possible for the series of events witnessed by several persons including this reporter. It wasn't a star, a meteorite, nor an airplane. It didn't behave in any manner recognizable, in the light of human experience. Extra-terrestrial phenomena seems to be the only explanation. It started at about 8:30 p.m. when this reporter was sitting down eating a cold chicken supper. The phone rang and an excited, almost panic-stricken voice gasped "John for God's sake, get out here. There's a flying saucer overhead spitting out light all over the place." Who's that, I asked. "Willis St. Jean. I'm at the Agaunico mine." I drove at high speed to the Agaunico, which is some three miles north of Cobalt on the shore of Lake Temiskaming. On arriving at the mine, I found Mr. St. Jean excited, almost frightened. "The thing came down low and scared the blazes out of me," he said. He pointed up to the sky. For a minute, I could see nothing. Then suddenly a light. It was a cold clear light moving from the east to the west. It banked and went out. Then it came on again and hovered motionless. There was no sound except for the noise from the mine's compressor. I stood in the snow covered yard of the Agaunico mine and watched the light for more than one hour. At times, it seemed to be quite low and at other times, it disappeared into the heavens. Mostly, I saw it come in from the east, hover above the mine and then go out. I got cold and went into the mine dry. St. Jean said he had been walking from the dry to the hoist room shortly after 8 p.m. when suddenly, the whole area was illuminated by a light brighter than daylight. "I looked up," he said, "and there was this giant cone of light shining straight down." St. Jean was alone at the mine while the miners were on Christmas holidays. The light was emanating from a giant rotating disc of pure light. The light was not just spinning but flying in circles. The cone was suddenly reversed and the disc sent its blinding light straight up into the sky. Then it flew over Lake Temiskaming, lighting up the ice-covered lake before it sped up into the sky. We stood chatting in the dry. Then we looked out of the back door. The light came back again from the east. It was cold and clear and brilliant. If it had any shape at all, it was slightly wedge-shaped but it was at immense height. It danced around for a while. We walked back into the yard. I took my flashlight and signalled. I flashed the light on and off then waved in a circle. The mysterious light in the sky flew away and disappeared. Watching it, it seemed as if we could only see the light when it was flying towards us or hovering overhead. When it banked, the light disappeared. I called my wife in Cobalt on the mines phone and asked her to go out into the garden and look for the light. I also called OPP Constable Pat Shannon in Cobalt and asked him to look for it. Later, they both said that they could not see anything. St. Jean said that he could see some lights out on the lake. We climbed a ladder resting against the dry. St. Jean said that he saw half a dozen red-tinged lights on the lake. I only saw one for a minute and then it disappeared. While we were standing there, a car drove up containing Mrs. St. Jean and some friends. Can you see that flying saucer?, I asked. "Don't be crazy," one of them said. Then they saw the light in the sky and fell silent. The group included William Montgomery, 27, of west Cobalt. His brother, Hugh Montgomery, 29, and wife Annette, 27, both of Kitchener, Ont. They all watched the light come and go, dance in the sky, hover and dart as no airplane nor star nor meteor has ever behaved. "I would never have believed it if I hadn't seen it," Mrs. Montgomery said. "And I don't suppose anyone will ever believe us anyway," her husband added. I left the mine at about 10:15 p.m. and drove back to Cobalt. The light was still hovering in the sky. About an hour later, accompanied by Lee Moore, Sudbury Insurance agent, I drove back but was told that the light had disappeared shortly after I left. What it was that this reporter saw that night, I do not know. I was stone cold sober and so were the others who witnessed the phenomena. As far as I am concerned, a flying saucer flew over the mine and I saw it. NORTH COBALT (Staff) - North Cobalt's flying saucer appeared again Tuesday evening. 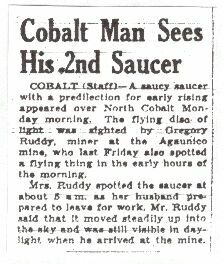 Maurice Parent, 28-year-old deckman at the Agaunico mine said the saucer streaked across the sky heading north. Parent was outside his Maple street home when he saw the saucer. He immediately called his wife and his next door neighbor Gregory Ruddy and Mrs. Ruddy. 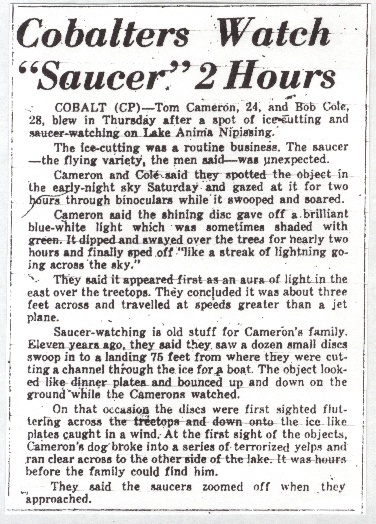 They said the saucer was as big as a soup plate and heading north at terrific speed above Lake Temiskaming. The brightly lit sphere suddenly disappeared above Haileybury. This is the third time that the Parents and the Ruddys have spotted the mysterious light that has been visiting the Cobalt district since December 26. Two North Bay students claimed sightings of what they took to be an unidentified flying object Monday night. Alan Helsler, 19, 203 Gladstone Ave., a Grade 13 science student at Algonquin Composite School, said today he sighted a "twinkling, red and blue light" in the south-western sky, about 15 degrees above the horizon, shortly before 10 p.m. 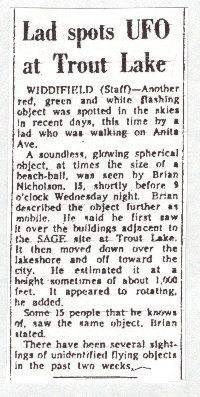 The single object was visible to the naked eye, Alan said, and sometimes appeared to be green in color. "At times it appeared to be red from the top and blue from the bottom," he said. "These were the predominant colors," he stated. He phoned a school friend, Gerald Chatlain, 18, also a Grade 13 student at ACS, five minutes after sighting the object. 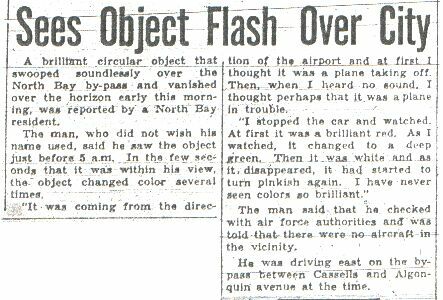 Gerald, 2275 Algonquin Ave., watched the object which he described as being in the same position as the original sighting. The two youths reported that the light "faded away" at about 11:30. Alan said the object or light didn't move and he described it as being in a fixed position in relation to the stars. He was unable to form any idea of the altitude of the object, but he and his friends intend to watch again tonight. A NORAD spokesman at North Bay told THE NUGGET today nothing had been seen on air force radar scopes that could be described as unusual. A department of transport official at Jack Garland Airport said there was nothing on the control tower=s log book to indicate that "anything unusual" was present in the skies Monday night. The last plane to leave the airport was an Air Canada Viscount which flew south to Toronto shortly before 8:30 p.m.
Another one was seen hovering in the sky over North Bay, Monday night. A bright light, sparkling like a diamond, hovered, then moved fractionally in the east about 30 degrees above the horizon between 9:45 and 10:15. The object had all the earmarks of the strange unidentified flying objects sighted around the world, recently. When the light first appeared, it glowed a bright greenish-white color, changing to the dull red, then back. Just before each color change, the mysterious object appeared to be four-pointed, almost like an aircraft with its wings at right angles to the fuselage. One bystander reported he heard the sound of jets in the sky just after the light was spotted. "After the planes went up, the light suddenly dulled and faded to a mere pinpoint." Checks with Control tower at Jack Garland Airport revealed that no strange readings were recorded on radar scopes. "Also," one official reported, "we didn't send any jets up to search for anything but of course the nightly patrols were on about that time." The light, appearing stationary but actually moving as indicated by THE NUGGET photo, went through its color pattern irregularly showing no uniformity as it changed from white to green then to red. At each color, it appeared to sparkle like a prism or light refracting through the facets of a cut diamond. The location where Monday night's object was sighted is the approximate site where most previous North Bay sightings were recorded. The light remained for approximately half an hour before fading away. Mr. MacNair, a mining engineer, said he had seen shooting stars before, but "never saw anything like this." Provincial police in the area said no one else had reported seeing such an object. STURGEON FALLS - Curiosity is still running high here over the reported sightings by two separate parties of an unidentified flying object over Springer Twp. Wednesday night. The sightings could not be tracked on radar, according to a report from Canadian Forces Base North Bay. Mr. and Mrs. Victor Olmstead of Golf Course Road, Springer Twp., first reported the sighting to the Sturgeon Falls Police Department around 8 p.m. Mrs. Olmstead said she had tried to reach the Ontario Provincial Police detachment but received no answer. Roland Bergeron, deputy fire chief at Sturgeon Falls answered the call and along with Police Chief Simon Lafleche witnessed the flying object as it hovered over the east and of Sturgeon Falls. Mrs. Olmstead first saw the object when she was returning home with her husband. "It was about 500 feet up," she told The Nugget. "When we first saw it, it had a bright whitish light on. The light was so strong it blinded me, yet it did not illuminate the ground." Mrs. Olmstead said the object in its stationary position parallel to the Golf Course Road for about one minute. Then it slowly started moving away parallel to the ground and suddenly accelerated at a high rate of speed. The object followed the road for about a quarter of a mile as Mr. Olmstead accelerated his vehicle to follow it. "Then, just like turning a switch off, the light disappeared and we could see three red lights," Mrs. Olmstead said. Mr. Olmstead said the surprise when he first saw the object nearly caused him to drive off the road. Mrs. Olmstead said the UFO followed at the north side of the road until it turned its bright lights off. Then the object went in a circular motion over the Laurentide Golf Course, moving slowly north towards the towers. On Hwy. 64 at this time, the couple lost sight of the UFO for about two minutes. Mrs. Olmstead said the object was moving more slowly than a helicopter. One of its red lights was flickering but the other two were solid. The red lights were fairly large. The couple then saw the object come back over the horizon at the same height and at the same time making its way south east over the golf course, disappearing over the horizon in the direction of the east end of Lake Nipissing. Mrs. Olmstead said the sighting lasted for about 10 minutes. Both Mr. Bergeron and Chief Lafleche saw something very similar. They claim the object had six red lights. They agree it moved from the area roughly over Laurentide Golf Course moving north and then back-tracking as it travelled over Lake Nipissing. The four persons agree the object was moving fairly slowly. Mr. Bergeron said he saw the object moving in a zigzag motion up and down at one time. Cpl. Gordon F. Hilchie of the Canadian Forces Base at North Bay said there was nothing on radar. According to him, there was "no activity whatsoever either for the reported sighting on Nov. 11 at Falconbridge or the one on Wednesday night." The Olmsteads are not amazed at their experience. It was the third such sighting for them, two in the last year. About 10 years ago, Mrs. Olmstead saw an object in the daytime, flying over Sturgeon Falls. Some time around then, Mr. Olmstead observed three discs flying over him. The UFOs had a blue and white light showing. Then several months ago, they saw a light moving over Lake Nipissing, too irregularly to be a helicopter or a plane. This was the first time the Olmsteads ever reported a sighting. "There have been so many other reports made, that at least now we know we're not nuts," Mrs. Olmstead remarked. For sky watchers Wednesday there were some interesting aspects to prevailing conditions other than high winds. Reports of strange sightings in the early morning sky came from various centres throughout the district, including North Bay and as far distant as Collinwood. Jack St. Onge, a Tembec employee who lives on a farm at Redbridge, told the Nugget he was doing his morning chores around the farm shortly after 5 a.m., Wednesday, when he noticed a green light in the southern sky. He said it appeared to be the size of a full moon and seemed to be approaching and growing larger. "My first thought was Halley's Comet and I called my wife Jane and the kids," he said. But by the time they came out of the house the big ball had disappeared and two smaller spheres could be seen with what appeared to be light beams coming from them. "It was a somewhat terrifying experience," he said. While commuting to Temiscaming with two other men he mentioned the incident. One of the two other fellows said he had seen a similar object but didn't like to mention it because he felt he would be ridiculed. At the Temiscaming mill Mr. St. Onge mentioned the incident to Rheal Viau, an electician also employed by Tembec and who lives at Ville Marie, some 80 kilometres north of the pulp town. Mr. Viau said he had also seen some strange but similar objects in the sky on his way to Temiscaming. The first was a yellow sphere which remained in view for approximately 10 minutes. Then a purple ball appeared and was visible for a matter of minutes. It disappeared and a few minutes later a white sphere appeared. Mr. Viau was travelling in a southerly direction and he said the three objects were clearly visible through the windshield of his vehicle. He also said projections like light beams could be seen on the left sides of the objects. Two truck drivers who stopped for a coffee break after an early-morning, southbound haul along Hwy. 101 from Ville Marie, told Temiscaming resident Rene (Gibou) Raymond, they had a strange experience near the village of Laniel, 34 kilometres north of Temiscaming. They said as they crested a hill a white cloud was sighted above the highway in front of them. Believing it to be fog they slowed and the cloud shot straight up into the sky. Mr. St. Onge said he reported the sightings to the North Bay office of Environment Canada. Barry Armstrong of Environment Canada, North Bay, told the Nugget there had been reports of other similar sightings, the same morning, from other centres throughout the district, including North Bay and as far as Collingwood. 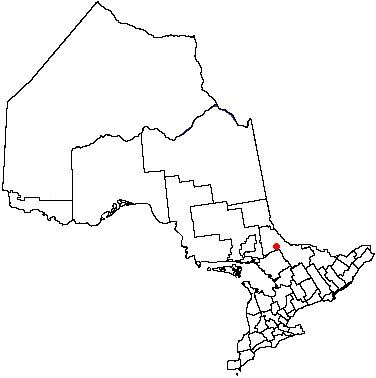 From Collingwood, Ted Aldridge, who is a professional pilot, reported sightings similar to those seen in this district. The Collingwood resident told the Environment Canada office the sightings had been made by himself and a friend Wednesday morning. Mr. Armstrong said Jim MacLean, also of the North Bay office of Environment Canada had taken detailed notes of the sightings and compiled a log of the reports. The Nugget also talked with Master Sgt. Don Weston of CFB North Bay. He said there had been "no indication" of any strange objects being sighted in the area. News clippings courtesy of The North Bay Nugget.